Tallied 202 punts, ranking third in FSU history…average of 42.4 yards per punt ranks fourth all-time…has 49 punts over 50 yards…averages 62.6 on kickoffs…has 134 career touchbacks. Played in all 12 games…broke single-season school records with 82 punts for 3,545 yards…average of 43.2 yards per punt ranked first in ACC and 31st in NCAA…boomed ACC-best 23 punts of 50-plus yards…also served as FSU’s kickoff specialist, averaging 62.5 yards on 51 kickoffs with 37 touchbacks, and holder for kicker Ricky Aguayo…made four tackles…named team’s Special Teams MVP…averaged 65.0 yards per kickoff or better in six games…punted career-high and school-record 12 times for 499 yards vs. No. 2 Clemson…registered career-high six 50-yard punts, including career-long-tying 61-yarder, and averaged season-best 50.1 yards per punt vs. No. 13 Florida…seven punts in 28-24 victory at Louisville included career-long-tying 61-yard kick…punted 10 times and made solo tackle at Syracuse…was perfect six-for-six on kickoff touchbacks and punted seven times for 325 yards in 36-26 win vs. Samford…matched season-high six touchbacks on seven kickoffs, punted seven times for 308 yards and made one tackle in 38-17 win vs. Wake Forest…opened season with touchbacks on both kickoffs and 199 yards on five punts vs. No. 20 Virginia Tech…averaged 43.1 yards per punt on eight punts and made one solo tackle at No. 17 Miami…kicked off five times, punted three times and had one solo tackle at North Carolina State…dropped two of four punts inside the 20-yard line at No. 3 Notre Dame…averaged season-high 65.8 yards on six kickoffs and punted six times with long of 52 yards in 22-21 win vs. No. 22 Boston College. Showcased a dominant leg as he finished fourth in the ACC in punting….tallied 2,849 yards on 66 punts, an average of 43.2 yards per punt…booted a career-best 61-yard punt, all in the air, in a win at Duke…ranked second in the ACC with 19 punts of 50 yards or more…coffined 22 punts inside the 20…also served as FSU’s kickoff specialist, and helped Seminoles rank 2nd in ACC and tied for 23rd in NCAA with 40 touchbacks…distance and placement on kickoffs helped FSU hold opponents to average starting field position of their own 23-yard line after kickoffs…named to ACC All-Academic Team. 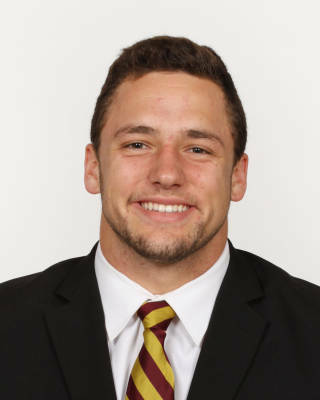 Replaced four-year starter Cason Beatty…had 54 punts for a 40.3 average, including 11 inside the 20-yard line and seven of 50 yards or longer…had 15 fair catches and two touchbacks…did not have a punt blocked…possesses one of the nation’s strongest legs and handled kickoffs and long field goals at the end of the season…on kickoffs, had 57 touchbacks on 90 kicks, an average of 64.1 yards per kick, which ranked No. 1 in the ACC and No. 9 overall in the country…his 57 touchbacks led the ACC and tied for fifth in the nation…the average starting position for opponents was the 23-yard line, and only one kick was returned past the 35…was 1-for-2 on field goal tries, making his first career attempt from 53 yards against Boston College…joined Dustin Hopkins (52, Miami 2009) as Seminole kickers to make a 50-yard field goal on first career attempt…had two punts of 50 yards (50, 52) in the home opener versus Charleston Southern…averaged 44.8 yards on a season-high eight punts at No. 10 Louisville, including a pair of 50-plus-yard punts…averaged 45.6 yards on five punts at No. 10 Miami, including a season-high 57-yarder…had a 54-yard punt versus Wake Forest…had a huge 51-yard punt downed at the five-yard line in the third quarter of a tight game versus No. 3 Clemson…had a punt downed at the four at NC State…all five of his punts went for a fair catch versus Boston College…two of his three punts versus Florida were downed or fielded inside the 20. Elite kicker prospect rated a five-star as both a placekicker and punter by Kohl’s Kicking…three-star prospect according to 247Sports, Scout and ESPN…nation’s No. 1 kicker by ESPN…extremely strong leg with field goal range up to 60 yards…hit a 90-yard kickoff at Kohl’s Kicking National Camp…kicked for Team Armour at the 2016 Under Armour All-America Game in Orlando…named the No. 2 placekicker and No. 28 punter prospect in the nation by Kohl’s…named to the USA Today All-USA Second Team Defense as a punter…named to Kohl’s Kicking All-America First Team as both a kicker (2013) and punter (2014)…collected First Team Missouri All-State honors as a placekicker by both media and coaches…named First Team All-Area (District 5/6) as a kicker, punter and defensive back…played quarterback, running back, safety and outside linebacker as well as kicker and punter at Nixa High School…unanimously named First Team All-Ozark Conference as a kicker and as an athlete…converted three of four field goal attempts and nailed 45 extra points and punted 22 times for an average of 43 yards as a senior in 2015…made 11 field goals and 38 extra points as a junior in 2014…also punted 51 times for a 44.5 average in 2014…recorded 140 touchbacks on kickoffs in three seasons…once made 19 consecutive kicks into the wind at Kohl’s Texas Showcase…born on July 30, 1997…majoring in psychology.